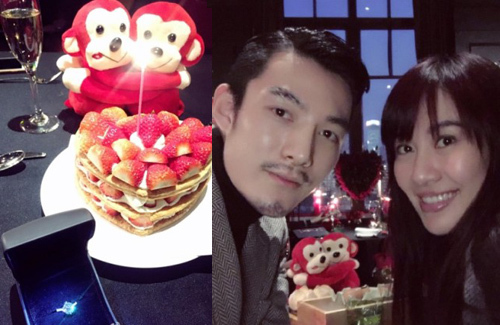 Valentine’s Day holds special significance for Michelle Ye (葉璇), as it is also her birthday. Turning 36 this year, Michelle has been in a happy relationship with Mr. Mo (小默先生) for slightly over a year. Since making their relationship public in July last year, Michelle has not been shy about flaunting their romantic moments on social media. Mr. Mo works is a fashion stylist based in Shanghai. He also serves as an image consultant for Mainland television stations, magazines, films, as well as international beauty pageants. Mr. Mo has served as Michelle’s image stylist on various occasions. Michelle is most impressed by Mr. Mo’s maturity, loyalty, and considerateness. It is understood that Mr. Mo gifted Michelle with a 2.14 carat diamond ring, to match with the date of her birthday. Flashing the diamond ring on her social media account, did Michelle in fact receive a marriage proposal from Mr. Mo? This article is written Jingles for JayneStars.com. Not a fan of this couple but that cake looks yummy! glad that she is happy but can she do us a favor and not flaunt her relationship so much? she and grace should be best friends. @riceball120 they should be VERY good friends since they love to yak. who is the guy anyway? @janet72 according to articles, some fashion designer/hair stylist (one of the two) for celebrities or something like that but definitely not an actor. They look good together. Congrats to the happy couple! Anyone knows where to watch ATV’s old dramas? Michelle Ye got a few really good dramas while she was still with ATV and I just can’t remember the names. I think in one of them she got raped or something. Man it’s been a long time but I keep searching for this drama. It was a really really good drama.